Madarao is located in the north eastern part of Nagano Prefecture, on the border of Niigata Prefecture. 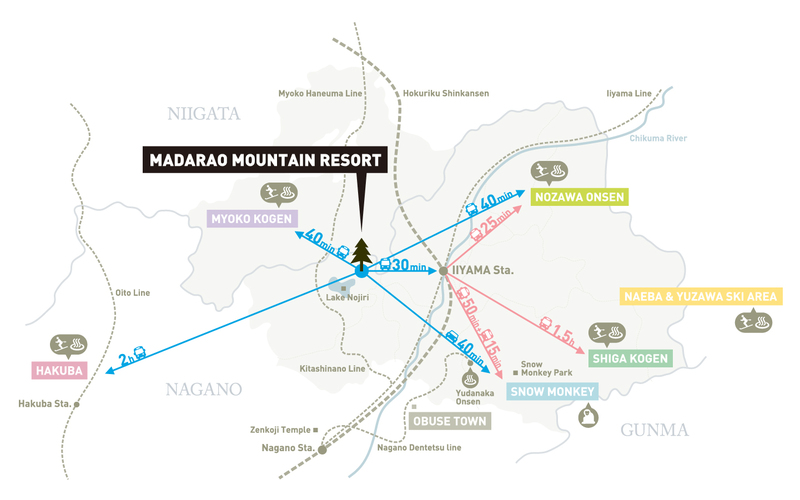 Madarao forms a “Hub” around which are various attractions and resorts. Close to neighbouring ski slope. 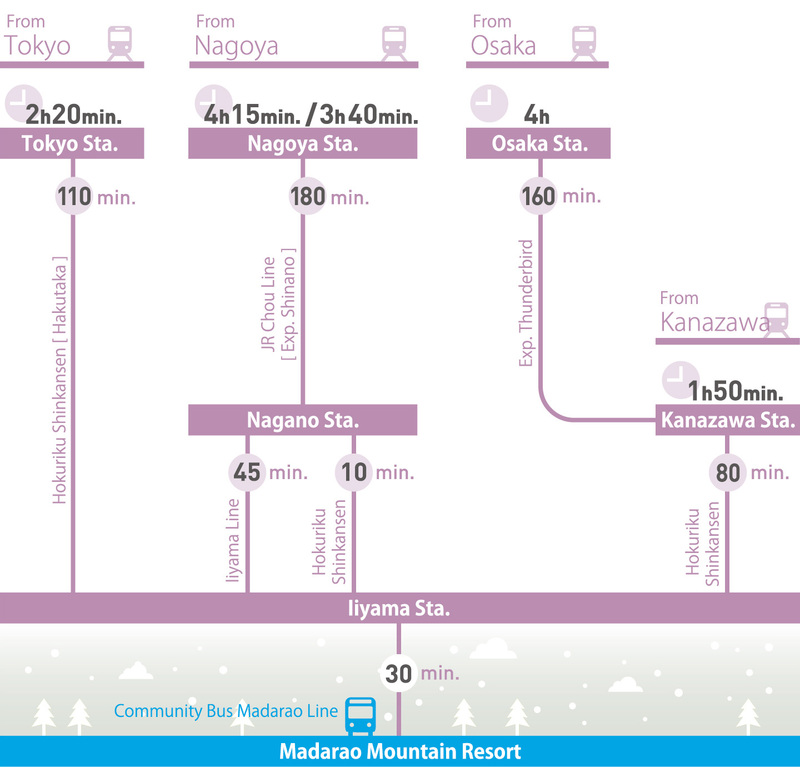 Just 40 minutes to both Nozawa Onsen and Myoko Kogen. Madarao is a great place to set up base and take day trips to surrounding resorts. Getting to Madarao is now speedier than ever thanks to the opening of Iiyama Station. A 110-minute Bullet Train ride from Tokyo to Iiyama, and a 30 minute bus/car ride to Madarao, and you are ready to hit the slopes. The Shinkansen also makes visiting Kyoto via Kanazawa quick and easy! Departing from Tokyo Station to Iiyama Station via Ueno, passengers can board the “Hakutaka” Bullet Train frequent departures throughout the day. 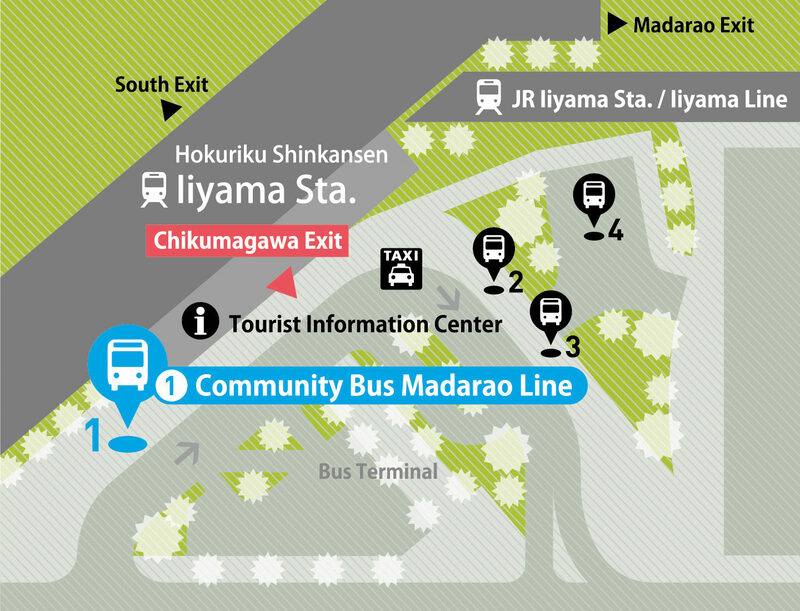 Jump on to the Direct local Bus to Madarao from Iiyama Station. The number of direct buses may be limited. Please check the time-table carefully. Local taxi is also available :approxi.5,000JPY. Travelling time 30 minutes. The stress free way to get to Madarao! Itʼs safe,confortable and affordable. Reach Madarao directly from Narita and Haneda Airport without changing in Tokyo with the airport shared taxi. Convenience and ease, and guranteed security. From the top of Mt.Madarao, you can both spectacular Myoko and Nozawa. Local buses and Inter resort shuttle service are available between these resorts.